rubbed and cracked, perfect in every way. singing and running, happy once again, once more. be back there for an hour in a second. That opening chord and scene of The Beatles’ A Hard Day’s Night: what a perfect memory for that era. (Not to mention the granddaddy prototype of all music videos!) If you don’t know it, check it out here on YouTube. 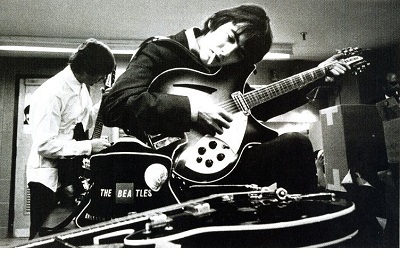 It was made possible by George Harrison acquiring a unique sounding 12 string electric guitar, made by Rickenbacker. (In fact there were two, an early prototype and a full production model.) It is hard, today, to understand what a powerful and trend-setting effect it had on popular music. For one example: so impressed by the sound was a young musician, Roger McGuinn, that he bought one and founded the legendary 60’s band The Byrds around it. Thank you for reading George Harrison’s 12 string Rickenbacker. I sincerely hope you have enjoyed it and I humbly appreciate your visiting the Book of Pain. As always, I look forward to your comments. I really love this, John. Time – can fly or crawl… Thoughts when one knows one is dying, but whether it is too soon or not soon enough… and memories fade in and out… Peace… Brilliant writing. Denise, thank you so much! Memories are very powerful, aren’t they? For me, for this poem, it was the opening chord and scene from The Beatles’ “A Hard Day’s Night” that got me thinking about George’s famous 12 string guitar. I started wondering where it was now that he was dead and that got me to thinking….well, of this poem. And Peace unto you!